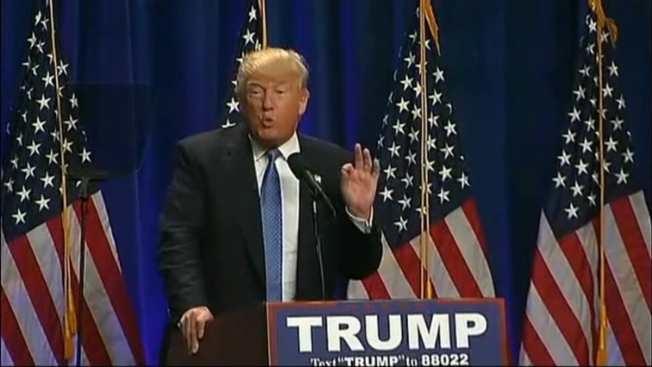 Trump Discusses Expansion His Proposal to Suspend Immigration to the U.S. In the wake of the mass shooting in Orlando, Donald Trump doubled down on his controversial proposal to suspend immigration into the United States, not just for Muslims, as he had said previously, but from any country where there is a proven history of terrorism against the United States. Trump began by saying he would not be talking about is democratic rival, Hillary Clinton, but it didn't take long for him to criticize her immigration policies and "political correctness." Trump said Clinton has no clue what radical Islam is, that she is in "total denial," and that her positions broadcast weakness throughout the entire world. Trump also criticized Muslim communities for not alerting authorities to those with radical behavior. He said Muslims "have to work with us" and that they know who the bad ones are. Former Massachusetts Sen Scott Brown, an early Trump supporter, said Trumps speech was rock-solid. New Hampshire state representative Al Baldasaro, who has worked with the Trump campaign, said Trumps speech will be well received because the American people want to hear politicians tell it like it is. Neil LeVesque, Director of the Institute of politics at Saint Anselm College says he is not sure how smart the speech was but he does know that if it has put Trump, once again, in the middle of the front page story.